Just a small add on. When you first inflate the tyre, leave the valve insert out. It restricts the air flow into the tyre. Inflate the tyre to around 50-60 psi, and then let it go completely flat again. Then re inflate it with the valve insert in place to the correct pressure. This helps to get the tyres bead nice and even on the rim. current bike. 2010 R1200GS. 83000 km and going as good as new. This is great if your in a shop. I would love to see a tutorial on tire change out on the trail with hand tools. Yes, YouTube is crawling with great works of fiction in which people easily slip tires on and off in seconds, with nothing more than a few tire irons and a bottle of Dawn dish detergent. If I did not know one person in the real world who can do this trick (even with those stiff-sided, bias-ply Harley touring tires), I would think the videos are fakes. Still, the fact that some people have some natural talent for this (or have sold their souls in return for the ability to do it) does not mean that a mere mortal like me can change a tire. I fell for the allure of the Harbour Freight tire changer some years back when I owned a Buell that consumed tires like they were potato chips. 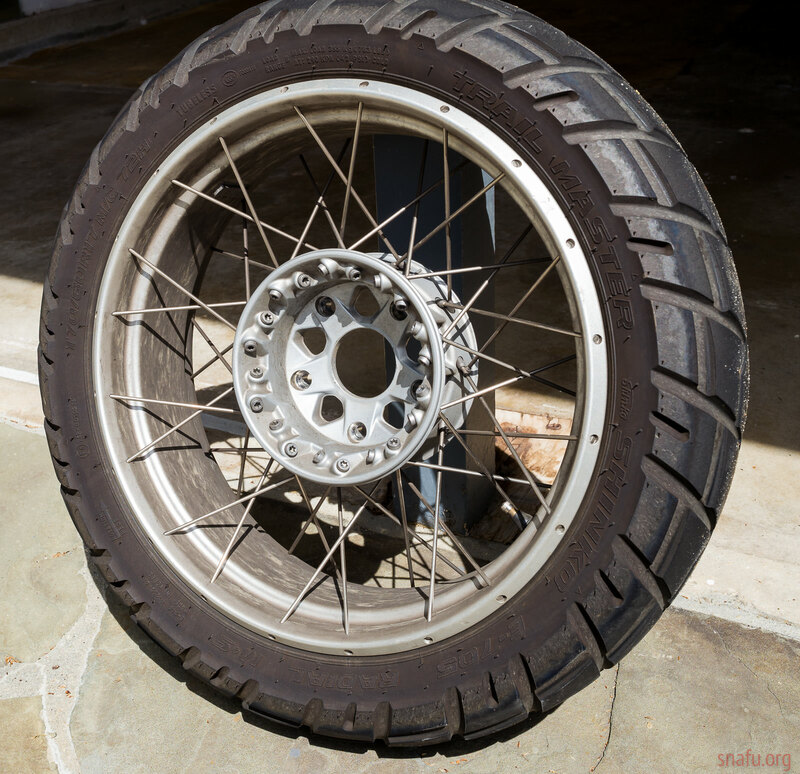 And, after a while, I got minimally competent at changing the tires on that bike... if you accept that sweating and cussing for forty-five minutes to remove and replace a soft-sided radial sportbike tire, using a tire mounting machine, is a form of "competence." This is one of the reasons I no longer have my KLR650: I had a flat tire on that bike, and the only thing I could do was call for help. Luckily I was near my favorite repair shop, and so I didn't end up paying a hundred bucks for them to come and get me (and their bike-rescue rig, with a crane that picks up and sets down a pallet with a set of wheel chocks and tie-down straps, was such a great show it was almost worth the service call just to see it in action). But what if I on some dirt forest road in the middle of nowhere? I'd be buzzard food, that's what. So now I have a GS, with tubeless tires that I can repair (assuming they're not slashed wide open) by the roadside. Not a simple process, but! I've been doing my own 705 to save a few $ plus local dealer won't do mine any more (they bought me a new wheel)and it's 50 miles to the nearest aftermarket shop that will mount and balance a tire they didn't sell! Y'know, with all the seminars and training they're planning for the MOA national rally, they ought to have a hands-on side-of-the-trail tire/tube repair class. I'd sign up for that in a minute! I ran Shinko 705s on my KLR before I replaced it with the GS. Nice tires. Decent enough on forest roads, good on pavement, confident in the rain. Cheap. Unfortunately, short-lived enough that if I don't install them myself they don't work out to be particularly cheaper per-mile than longer-lived, more-expensive tires. May have to learn to mount my own tires anyway, because my favorite indy shop changed their policy over the winter and now charges an extra $15 to mount a tire that wasn't bought from them... and their supplier doesn't carry Shinko, Heidenau, Mitas, etc. (they do carry Michelin Anakee IIIs, not sure about Continental TKC70s). Last edited by saughblade; 12-Jun-2018 at 07:20 AM (514). FWIW I get about 8K miles per 705 on my GS. I could get more. I do install my own tires. This was the rear tire I last replaced after a little more than 8K miles. I replaced it before a trip. If not for the trip I'd have run it a little bit longer. I get 4K miles rear and double that front. New tires every couple months Thus I do my own mounting and balancing. Thank you for this thread Jim. I have been going through a slew of nail flats lately(see your plug thread)and have thought I should learn this myself. I do my own Kart tires, but have never given my bike tires a shot. Now I will. P.S. Thanks for doing the Maint. DVD! Saved me $190.00 last weekend by doing my own valves and throttle body sync. The DVD was money well spent! Hi. You referenced a maintenance DVD. Where can I find that?